A walled city of 60,000 people, Dubrovnik is something out of a fairytale. Unfortunately, everyone seems to know it already, so every place is teeming with tourists, and no low season either these days or so I hear. Dubrovnik was already quite a favorite with the Western Europeans because of its low costs, now the world has rediscovered it thanks to Game of Thrones. Good old Indians have discovered it because of—no prizes for guessing—Bollywood! Shah Rukh Khan’s movie Fan was shot here. Soon I fear, there’ll be more tourists than locals living in Dubrovnik. Are you planning to go too? Wondering what you can do in two days? Loads! I could’ve spent the whole day here if I could. The sights, oh my! I clicked about 200 pictures and not one of them can I leave behind. The bright red of the corrugated roofs, the calm of the blue-green waters, the looming centuries-old forts, the muted din of the regular lives from the city below…it was like walking inside a medieval kaleidoscope. The Walls of Dubrovnik are a series of defensive stone walls surrounding the city, constructed over the 12th –17th centuries. The town has four city gates: Pile, Ploce, Peskarija, and Ponta. Gate of Pile (pronounced peelay) was the one we used mainly. On the eastern side stands the second major entrance, Ploče. The main wall on the sea-facing side of Dubrovnik stretches from Fort Bokar in the west to St. John Fortress in the south, and to the Revelin Fortress on the land-side. These walls are 1.5 to 5 meters thick, depending on their location and its strategic importance to the city. Arrive as early as you can, if possible at the opening time (which is 8 AM Apr-Oct). After 10 AM it gets very crowded with the arrival of the cruise ships and the starting of the walking tours. Opening hours through the year can be found at this link. It takes 2-3 hours to complete the nearly 2 km stretch. There are tiny cafes and stores dotting the length of the walls selling coffee, orange juice, ice creams, and croissants. Entry fee: 150 Kuna, including entry fees to Fort Lovrijenac to be done within 24 hours. Hands down the highlight of my Dubrovnik trip, with the Game of Thrones theme song playing nonstop in my head. I used Dubrovnik walking tours (one with the red umbrella) which was good enough. We were a large group and the good part was we got headphones so we could hear the guide at all times. The tour was cheap at 150 Kuna (additional 50 Kuna entry fee to Fort Lovrijenac if you do not have the tickets). All the tours seemed of more or less the same quality (several were happening around us), some perhaps more personalized than others, so take your pick. Or do your own, it’s not hard. Fort Lovrijenac – Usually this is covered as part of the Game of Thrones tour. Except for a few vantage points to take pictures, it’s not really a place to spend more than 20 minutes in. Entirely skippable if not a fan. “Time stands still in Lokrum Island,” our GoT tour guide told us. “The Dubrovniks go there to rest.” The island is full of gravelly paths, tall trees, peacocks, and rabbits! The monastery in the island was the setting for Qarth and there is a Game of Thrones mini-museum on the island where you can click pictures sitting on the Iron Throne. There’s a swimming cove (called the Dead Sea), but it can get crowded in summer. Food and drinks are expensive on the island, but you could carry your own food and have a picnic. Tickets to the island cost 150 Kuna return. Go to the boat directly and buy tickets. No need to go to tour operators that throng the port. The trip to the island takes about 15 minutes. Boat timings differ according to the season. We couldn’t do the tour because of choppy waters, but kayaking looked like a great way to spend the evening around the Walls, watching the sky turn orange as the sun set in the far distance. The rocky hills around made for a surreal company. You can either use tours or rent the kayaks to do it yourself. Dubrovnik Wine Tours by Mario comes highly recommended and needs advanced booking. Always runs full. Or you can taste some wine at D’vino Wine Bar Dubrovnik. There are a couple more around, advertising at the mouth of their lanes. Sit on the top of the steps, sip from your glasses and smile knowingly at the tourists below. Try the Octopus burger at Barba. And we were never disappointed at Presa – the quaint little café by the side of our apartment. Excellent service, great cheap food. Placa (Stradun): Obviously you’re going to start here. Stradun is Dubrovnik’s main street. Paved with limestone, the street is lined with quaint shops and restaurants. There are mini streets which snake inwards with more treasures to shop or eat in. Plenty of apartments to rent and stay, right at the heart of the action. Onofrio’s Great Fountain: Just next to the Pile Gate as you enter the Old Town, you can spot the Great Fountain, still functioning 550 years after it was built. Orlando ’s Column: Built in 1418, Orlando’s Column symbolized the city’s independence for nearly 400 years. The statue is of Roland or Orlando, a military leader under Charlemagne. St. Blaise Church: Saint Blaise is the patron saint of the city of Dubrovnik and formerly the protector of the independent Republic of Ragusa. The church was built in 1715 and is one of the landmark places to visit in the city today. Sponza Palace: Is a 16th-century palace. The name comes from the Latin spongia, the spot where rainwater collected. The palace has served a variety of public functions, including as a customs office and bonded warehouse, mint, armory, treasury, bank and school and is now home to the city archives, which hold documents dating back to the 12th century. Rector’s Palace: The Rector’s Palace used to serve as the seat of the Rector of the Republic of Ragusa between the 14th century and 1808. It also housed an armory, the powder magazine, the watch-house, and a prison. Franciscan Monastery: The Franciscan Church and Monastery is a large complex belonging to the Order of the Friars Minor. It consists of a monastery, a church, a library, and a pharmacy. The pharmacy is particularly interesting since it is the oldest functioning in Europe (700 years old!). Revelin Fort: Overlooking the Old Port, Revelin was completed in 1549, and today houses a nightclub. A trip to Mount Srđ using the cable car takes 10 minutes and 150 Kuna roundtrip (gulp!) but the views are to die for. Plus you can save by taking a trip up in the cable car and then walk down through the trail; the latter takes about 45 minutes. I also recommend going to the Fort Imperial on Srđ hill to see the exhibition on the Homeland War 1991-1995. It costs 50 Kuna and has only a few exhibits, often just pictures of Stradun in various versions of disrepair, but I still learned a lot. More so, after watching the movie on the bombing of 1992. 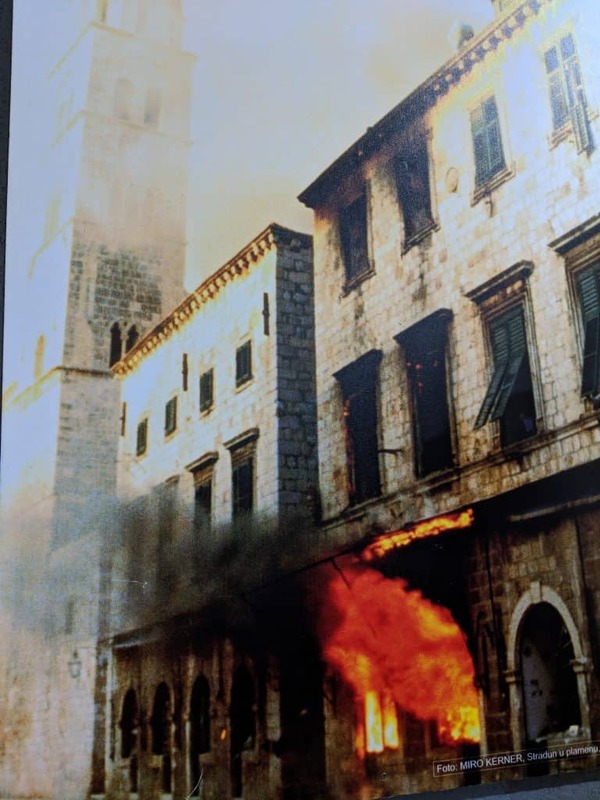 The Siege of Dubrovnik was the war fought between the Yugoslav People’s Army (JNA) and Croatian forces defending the city of Dubrovnik. The intent was to seize Dubrovnik from Croatia and annex it to Serbian-Montenegrin control. 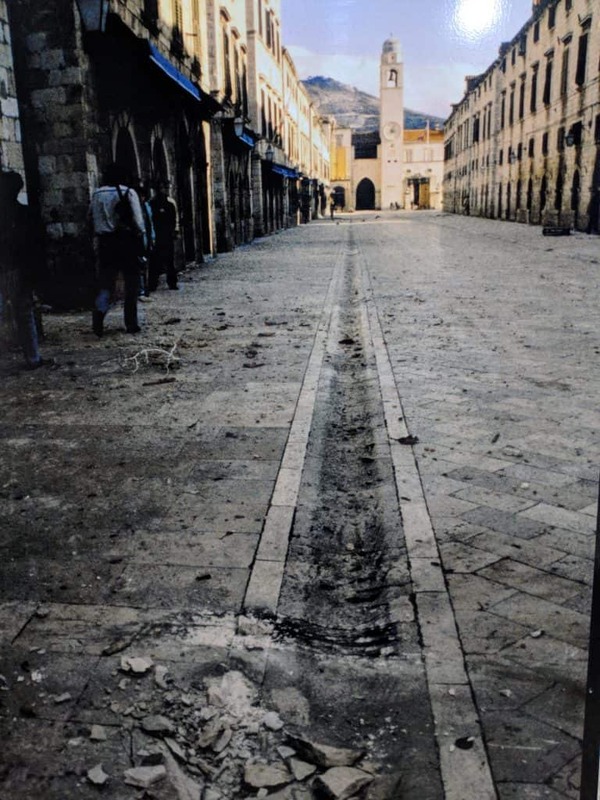 The JNA’s bombardment of Dubrovnik started on 23 October 1991 and ended on 6 December 1991. The siege resulted in the deaths of 194 Croatian military personnel and 92 civilians. I believe they were the images of the beautiful UNESCO world heritage city being destroyed that really caused the massive uproar afterward (the shelling was shown on TV channels worldwide, clippings of which you will also see in the Museum) Because by then and even afterward, people were dying or being displaced by scores all over the Balkans. Images can really be powerful. 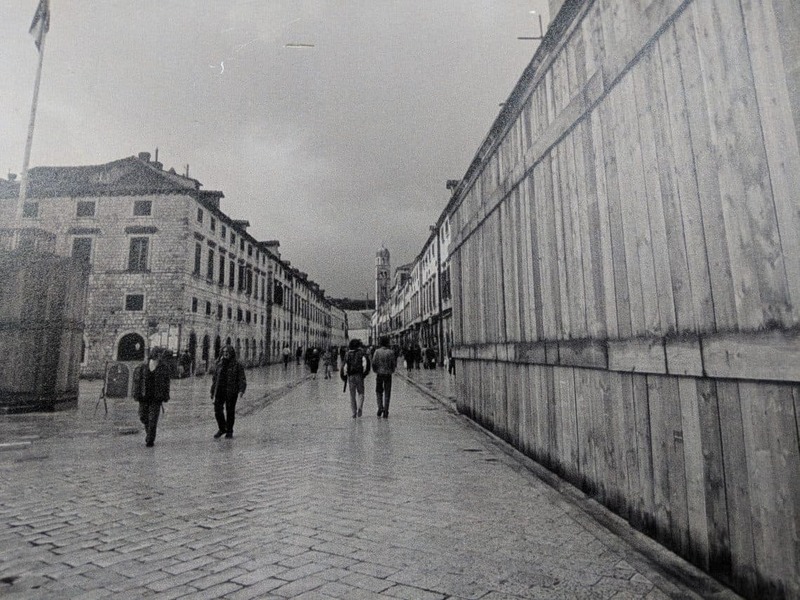 See photos of the Stradun then and now. Tip: Pay the 50 Kuna and go to the Fort Imperial museum, walk to the terrace just to see the drop-dead view in complete isolation. Not many people go to the museum, so the terrace is about empty. I had all the time in the world to sit and enjoy the beautiful panorama around. The highlight of my day. There are a few restaurants on top, but to sit there and savor the view you need to pre-book (or so they claimed when we asked), so don’t count on it. Nautika or 360: For a quiet pricey dinner with a view. Buza bar: Buza means ‘Hole in the Wall’. It’s a bar with a wonderful view. But that’s about all you’ll go for. Drinks are quite limited and expensive. Service lackluster. A tourist tick mark. OR pick up some beer and burgers and head to the port which is deserted at night. Sit with the waves breaking on the stones, chug a few sips of delicious beer and marvel at the beautiful vacation you’re having. More on Nightlife options in Dubrovnik in Telegraph’s list. Life According to Kawa: A shop with exclusively designed gifts and products, handmade in Croatia. Not cheap but one of a kind gifts (coffee mugs, craft beer, magnets, postcards, bags, jackets, sunglasses etc.) to take back home. Located just opposite the Ploče Gate, you can go here on the way to the cable car. Kokula Art and Craft Shop: Another store with traditional handmade souvenirs. Art by Stjepko if you like vibrant paintings, and mostly of Croatian landscapes. : The local supermarket. Pick up rakia, wine, beer, coffee, creams. Tip: Go easy on the Game of Thrones souvenirs. Not only are they overpriced, but they’re also variably priced across stores. So compare before you buy. We stayed at Stradun View En Suite Rooms & Studio. A room for two costs USD80 -120 (depending on season) It was fantastic. As central as could be. Uber: It exists but as most of Croatia (and increasingly many parts of the world) there is a major tussle between taxi drivers and Uber drivers, so the Ubers avoid coming close to a taxi stand or anywhere near a train or ferry stop where taxis wait. Arrange to meet them away. Taxi and travel: We used Laus Travel (Ivo +38598344231). Reasonably priced and good service. Getting to Dubrovnik: There’s an airport in Dubrovnik and getting to the city in taxi costs about 200 Kuna. It’s a 30-minute journey. Airport buses ply as well. Croatia has a separate visa (Information for Indians) but if you hold a multi-entry Schengen that covers the period of stay in Croatia you’re allowed entry for a period not exceeding 90 days in any 180-day period. Only applicable for tourists. For a 7 day itinerary in Croatia, visit this link. For a 48 hour itinerary in Zagreb, visit this link. For a 48 hour itinerary in Split, visit this link. We lucked out on hotels in Croatia. Each was more fantastic than the next.